Want to include your pet dog or cat at your wedding? 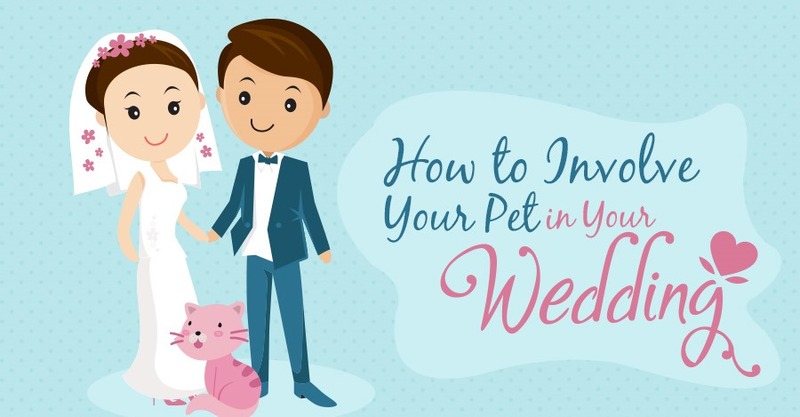 Scroll down to our infographic below to learn how to plan a pet-friendly wedding. It appears that pet-friendly weddings are on the rise, with 30,000 people searching for the term “pet wedding” on Etsy in 2018. According to a 2016 study from Brides Magazine, 8% of wedding ceremonies in the United States included pets. It’s clear that pets play an important role in modern relationships. In fact, 45% of millennial pet-owners say that it is more important to them to get their pet’s approval of a new partner than that of their family. What’s more, research from Buffalo University has revealed that pet-owning couples more likely to have closer relationships, are more satisfied in marriage and respond better to stress than couples who do not. Animals can be nervous creatures, so it wouldn’t be fair to foist a wedding day on them without considering if they can handle a starring role on your big day. Before making any decisions, reflect on whether or not your pet will be comfortable in a wedding situation. Ask yourself if they comfortable with crowds and if you can you can rely on them to behave? Think about timing too – your pet should stay for no longer than two hours to avoid becoming too tired or stressed. It’s usually better to involve the animal in the ceremony only, they may be overwhelmed by the loud music, crowds and general hustle and bustle of the reception. Contact your venue to confirm that animals are allowed. Give your guests a heads-up so that those with allergies can plan accordingly. Let your photographer know in advance so they can get some action shots of your pet. Alert your florist and ask them not to use plants that are toxic to animals. Check the menu to make sure that nothing toxic to the pet is included and also ask the guests beforehand not to feed the pet from the table. Let your pet lend a paw with the proposal. They could carry a written proposal or even carry the engagement ring itself in a special collar. Find a way to incorporate pictures of your furry-friend into the design of your save-the-dates. This is an ideal option for owners of animals who think their pet would be overwhelmed by the wedding. This option is best for highly socialised and well-behaved animals on whom you can depend to complete the job. Fit your pet with a special collar or harness so to ensure that the wedding ring is securely transported to the alter. Ask your florist to create a special collar or leash for your pet made up of animal-friendly buds and blooms. Alternatively, you could have a human flower girl or ring bearer walk your pet down the aisle. If you want to include your pet to the wedding but don’t think they’re up to a big role, why not just invite them as a guest of honour and they can simply stand in during the ceremony. Don’t forget to include your pet in your engagement photos and post-ceremony portraits. If your pet will not be able to make it to the wedding, you can still honour them with a custom cake topper depicting the happy couple and pet. If you intend to dress up your pet for the occasion, make sure the clothes fit and do not cause them any discomfort. Keep the accessories simple and ensure that they are securely attached so that they don’t pose a choking hazard. On the week of the wedding, bring your pet to the grooming parlour so that they look and smell good. Planning to walk down the aisle with your pet? Leave time for plenty of training and practice runs so that your pet can walk down the aisle with confidence. Consider asking a member of the wedding party to carry the pet down the aisle if they are the anxious-type. If your pet gets easily excited, be sure to use a short leash. Don’t trust your animal ring bearer with an expensive ring? Simply use a fake and leave the real one with the best man. On the day of the wedding, ask someone to take responsibility for your pet throughout the day. If your pet is a dog, make sure they get a good, long walk before the ceremony to wear them out because a tired dog is a good dog! Jennifer Aniston and Justin Theroux reportedly gave their dogs, Dolly and Sophie, key roles in their intimate 2015 back garden wedding. The country singer Carrie Underwood strolled down the aisle with her dog, Ace. The pup sported a dazzling pink tux adorned with Swarovski crystals. In 2015, John Legend officiated a wedding between his beloved pooches, Puddy and Pippa, in a beautiful ceremony in 2015. The well-known soul singer played many parts – acting as guest of honour, wedding singer and best man – in the intimate, one-guest ceremony.